Patagonia's highest-performing, most durable, feature-rich waterproof/breathable waders with a TIZIP® waterproof front zipper have been updated with a trimmer upper-body fit that still layers easily; H2No® Performance Standard waterproof/breathable wader. 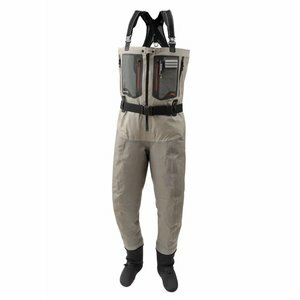 The Rio Gallegos Zip-Front Waders bring the convenience of a waterproof front TIZIP® zipper to the toughest, most puncture-resistant, waterproof/breathable waders that we know how to engineer—and now they’ve been reengineered from the booties up. 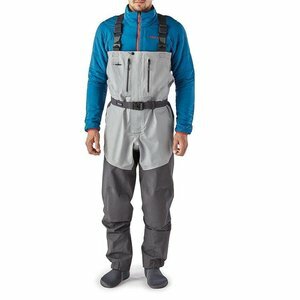 Our Rio Gallegos Waders are still built from our tested-and-proven 4-layer H2No® Performance Standard fabric package using single-seam construction to route critical seams away from areas of high wear, but now we’ve streamlined the entire feature set for a new level of comfort, performance and durability. We started by removing two inches of fabric from the hip, waist and chest for an improved fit that still easily accepts layers for long, cold sessions. 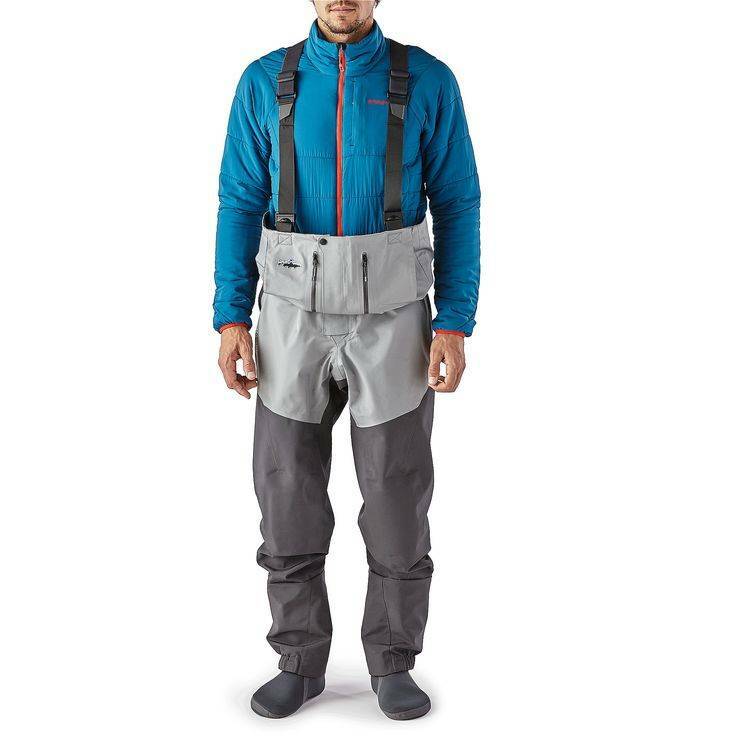 Patagonia re-patterned the crotch so it’s no problem to swing a leg over gunwales, and we brought more articulation to the leg for those moments when fishing brings you to your knees—like keeping a fish wet during the photograph and release. 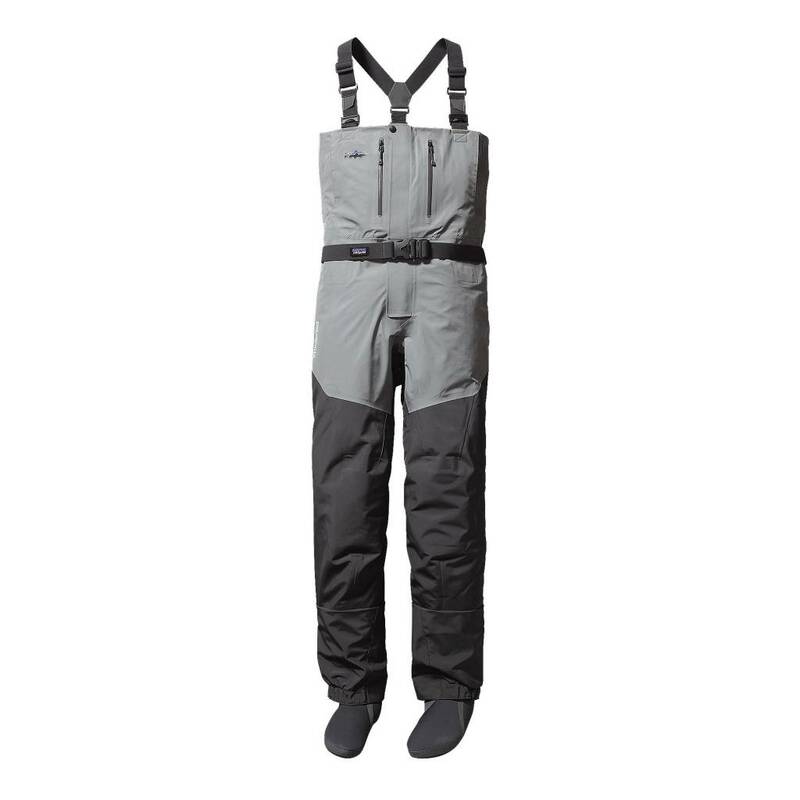 If you fish in and out of boats, you’ll appreciate the flat-panel gravel guards: they drain water more quickly than our old design, in addition to better resisting abrasion and wear while hiking or wading. Our improved booties have a more anatomical, sock-like fit and are made from a denser 4mm neoprene that resists compaction better over the long haul and have a poly-grid lining for added comfort. Our innovative internal suspension system allows easy conversion to waist height when you aren’t wading deep. Outside, there are two handwarmer pockets and two stash pockets with water-resistant zippers. Interior gear storage includes two new drop-in stretch pockets and two internal daisy chains for tools. Other fishing-friendly features: center-back hanger loop for easy drying; stretch wading belt with low-profile buckle; removable knee pads; and a raised Fitz Roy Trout logo tops it off. Field repair kit included. *H2No® Performance Standard polyester microfiber shell, with a proprietary waterproof/breathable barrier and C6 DWR (durable water repellent) finish; highly durable and puncture-resistant fabric without multiple layers or added weight. *Submersible TIZIP® front zipper is fully waterproof; waist-mounted EZ-Lock suspenders allow easy conversion from chest to waist height; full elastic belt. *Innovative SSC (single-seam construction) seaming completely eliminates seams from highest wear points on inside of legs. *Interior organization: two drop-in stretch pockets; two internal daisy chains for tools; center-back hanger loop for easy drying. *Exterior organization: chest handwarmer pockets; two stash pockets with water-resistant zippers; laser-cut Hypalon® utility keeper on suspenders allows easy access to tools, nippers, etc. *Articulated legs; removable foam knee pads. *Anatomically fit left and right booties have a lower volume, more sock-like fit and are poly-grid-lined for added comfort; resilient 4mm neoprene resists compaction for greater durability. G4Z® stockingfoots are built for the pinnacle with 5-layer GORE-TEX® PRO SHELL fabric that bolsters durability and enhances breathability by 25 percent.